Duaringa rest area = free! Well you remember in the last post on this blog I said we are not far from the railway line and there seemed a train every 20 or 40 minutes well straight after I finished the blog the trains stopped. We thought great maybe they won't be going during the night ... they started up again just around dinner time - mainly trains that are carrying ballast so they are fixing up the railway line at the same time as transporting coal! The coal trains soon started up again and this time they ran from about 6 - 8.30pm and they seem louder at night but I think that is because they are repairing further down and so they have to brake at Westwood as some of the trains were very loud when they applied their brakes and one train had a square wheel on one of the last trailers as there was a 'ker donk, ker donk, ker donk' as it went past us. So by 8.30pm they seem to have stopped so we went to sleep and they started up again at around 2.30am up until then we slept quite well. They ran for a couple of hours and then stopped and restarted at just before 5am. So not exactly like Nebo but very intermittent with their running of the trains. We left this morning at 7.30am. It was a nice morning, a little cloudy but the sun was shining. traffic is a little heavier today, mainly trucks, but they were fine with us. We still have our shoulder, although for the few kms out of Westwood it seemed to narrow a fair bit that we struggled to stay in there. But for the majority of the ride it was in a wide shoulder that could have a rough surface at times. this was a flat piece of road. Todays ride was a bit up and down but the legs coped ... even with the ride over the Gogango range (Sharon - it is best to say 'Gogango' like how you use to say 'D-Jango' ha LOL) That was a lovely 5km climb that was done mostly in the middle chain ring, it was a easy gradient. The down hill was there but not like a full down hill ... the usual down, up and down to go down! 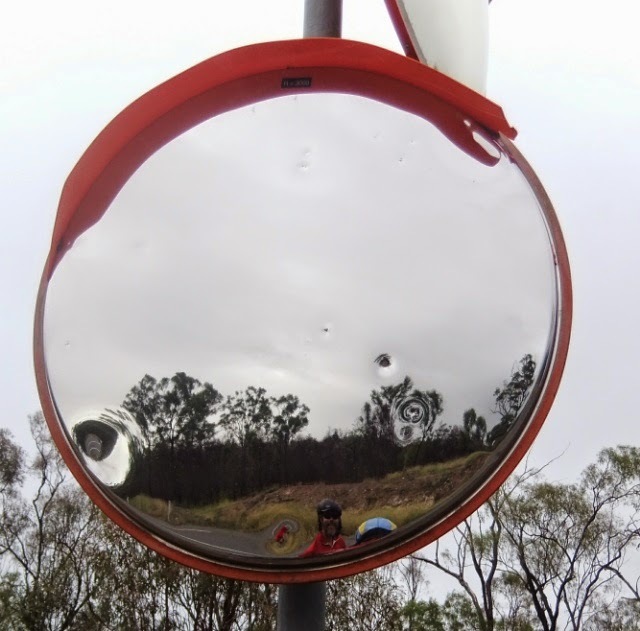 At the top of the Gogango range was these mirrors to direct the traffic out of the side road ... I love these but didn't quite pull of the photo ... you can see my helmet at the bottom and you can just make out Neil! 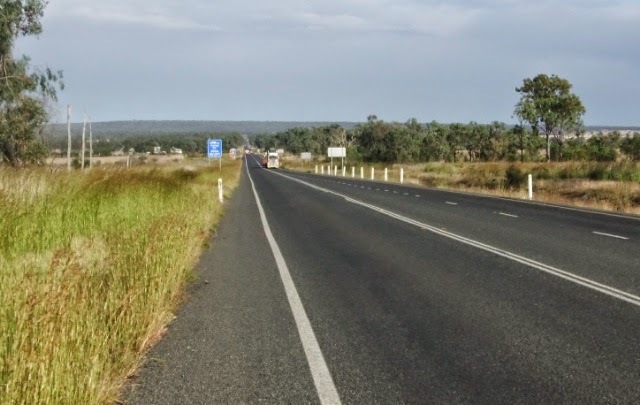 so from here we made out way down to the flood plains from there the road swings in a north west direction to Duaringa. We have 3 bumps to get over, the first is okay then the second is smaller but once you get to the top of the second you see the last and it looks long and steep but as you go down and approach the third it isn't as long but it is steep - 8.5%. Some of the trucks struggled but we seemed okay with it ... I was surprised as it is at the end of the ride and usually the legs feel a little heavy ... obviously the weeks break did us a world of good! We have stayed at Duaring before - it is a massive Rest area with hot showers and toilets. We got here at lunchtime ... I haven't taken a photo as it is drizzling a bit so I will take one and put it on tomorrows blog. At the moment there are about 20 of us here (groups), off course we are the only tent! We have pitched on the outskirts as most vans tend to park nearer to the toilets ... I don't know why as they all use their own ones in their vans. Tomorrow is a long day to Blackwater.